Welcome to Global Finance’s annual Treasury & Cash Management Guide, in which we explore the latest trends and issues in the world of global cash management. With record corporate earnings, companies are wanting to get the most from their cash. To some extent they have already been able to achieve greater visibility into their cash flows by centralizing treasury operations and deploying sophisticated treasury management systems and liquidity management techniques such as multi-currency pooling. Now firms are pondering the question, Can liquidity be managed globally? Do treasurers know at any given moment where they have excess liquidity globally that can be deployed to help finance acquisitions or invest for higher returns? 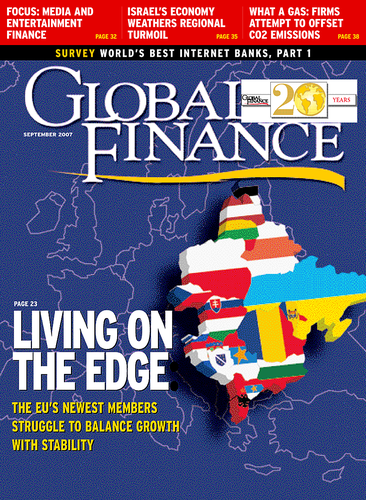 While there are significant challenges in achieving this level of visibility, high-end treasury management systems, Internet-based reporting, harmonization and standardization across Europe and relaxation of foreign exchange controls in some countries are helping companies move closer to having a global view of their liquidity. Meanwhile, the number of options for companies to trade FX online is increasing as companies move smaller trades online in an effort to achieve greater price transparency, with larger trades still being conducted via the phone. Companies can choose from a plethora of multibank and single-bank portals for trading FX, but online trading is not just about price discovery. It is also about improving back-end processes. Some concerns remain, though, about the ability of online FX platforms to handle workflow into clients’ systems. On a slightly different note, the increased incidence of identity fraud is presenting new challenges for companies globally. Regulations such as Sarbanes-Oxley are also placing pressure on companies to ensure incidences such as Enron don’t recur. With that come myriad challenges for companies, weighed down by different proprietary identity-management solutions, which can number in the hundreds depending on the number of banking relationships they maintain. A few pioneering corporates are leading the way, forcing banks to abandon their proprietary solutions and embrace a single identity-management solution that can be used across multiple banks.